Which N.Y. Rangers Players have the Most Hobby Love to Gain in the 2014 NHL® Stanley Cup Final? 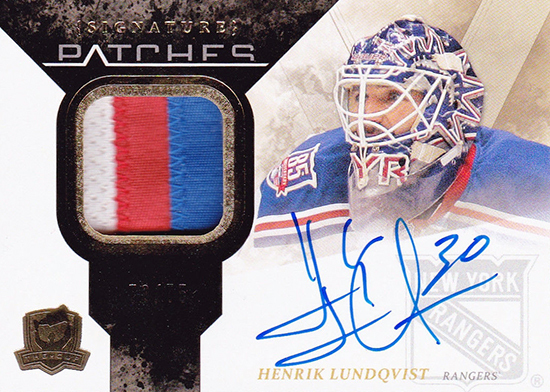 Henrik Lundqvist — I don’t think any player stands to see his card value benefit more from a championship than “King Henrik,” who is already one of the clear-cut top-five goalies in the world (probably top three). He’s won Olympic medals (including gold in 2006) and he’s been an NHL star since he first came to the league almost a decade ago, so his value is pretty well established. With a Cup championship added to his resumé, it’s not at all unrealistic to think he could approach, equal or even surpass Carey Price as the most collectable active goaltender. If Rangers win it all, Lundqvist will almost certainly be the Conn Smythe Trophy winner. Martin St. Louis — He was the oldest player ever to win an NHL scoring title last year, and won an Olympic gold medal in February, so he’s clearly still playing at a very high level. He won a ring in 2004 and he’s been a league MVP, but he’s always been a little underrated from a collectors’ standpoint. At 38, St. Louis’ value is pretty well-established, but the move from Tampa Bay to New York can only help. The fact he’s been playing so well in these playoffs while also grieving the unexpected passing of his mother is truly remarkable, one of those heart-warming human-interest stories that can’t help but endear you to a person. The Rangers have played their best hockey since he returned to the team to play Game 5 in the second round against the Penguins only a day after his mother’s death. They seem to have been truly inspired by his dedication to their common cause of winning a championship, and it’s a story that’s impossible for hockey fans and collectors to ignore. The tricky part is his rookie card is not a Young Guns rookie and it features him with Calgary. 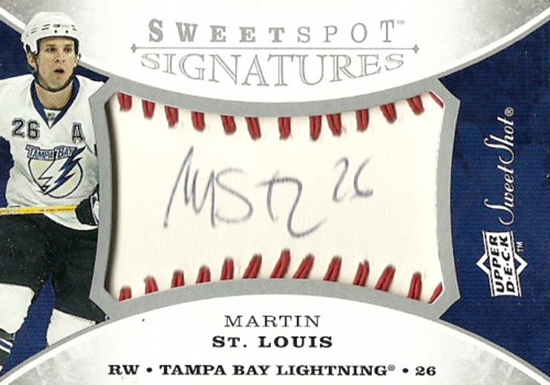 Given the cards are not short-printed and feature him with the Flames, they are not in high-demand and are readily available. 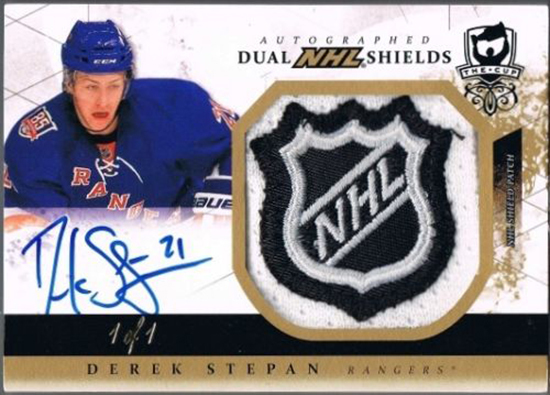 His first cards with the Rangers will be in 2014-15 NHL® MVP and should carry a real premium, especially if he can help bring a Cup to New York! Carl Hagelin — Watching Hagelin pull away from Canadiens defenders to score a huge shorthanded goal in Game 4 of the Eastern Conference Final, and seeing him fly in on Jonathan Quick for two separate breakaways in Game 1 of the Final, Hagelin’s breathtaking speed has been on full blast this postseason. Perhaps not less noticed was that, immediately after Quick stopped him on a potential game-winning breakaway with half a minute left Wednesday, Hagelin skated just as desperately and swiftly on the backcheck to get back and break up Jeff Carter’s wraparound bid to end the game in regulation a few seconds later at the opposite end of the rink. 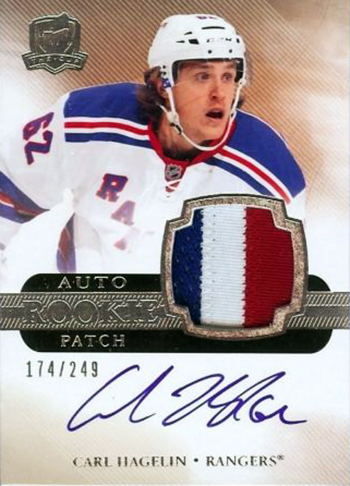 If he keeps up his excellent play and the Rangers win the Cup, we expect a big jump in value for his cards. Ryan McDonagh —McDonagh has played well enough (after a somewhat slow start to the playoffs) to bump himself up to the second tier of elite defensemen, alongside guys like Phaneuf, Keith and Seabrook, Pietrangelo, Letang and Erik Karlsson. 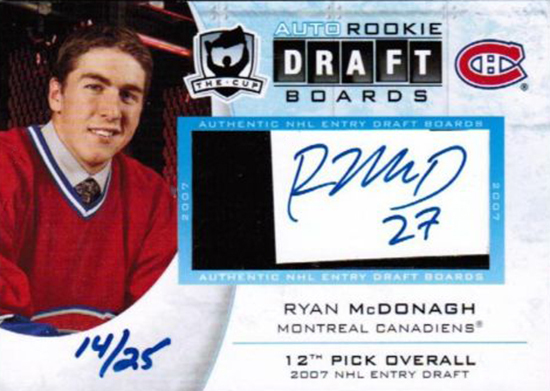 It had to be extra painful for Canadiens fans to watch McDonagh, Montreal’s 12th overall pick in 2007 before he was traded to N.Y. prior to ever suiting up for the Habs, pile up a series-best 10 points in helping eliminate their team. Honorable mention — Derek Stepan, Mats Zuccarello and Chris Kreider have earned an honorable mention. All three are quality young players who haven’t traditionally gotten enough attention from collectors for their high levels of play. This trio, along with Hagelin, McDonagh and J.T. Miller, have a chance to be something special and form the nucleus of one of the best teams in the league for years to come. Stepan took a hit that broke his jaw in Game 3 of the Eastern Conference Final against Montreal and finished the game! He missed only one contest before returning to the lineup in Game 5 to score two goals playing with a heavy-duty shield on his helmet to protect his face. Zuccarello, the 5-foot-7 Norwegian sparkplug with the Italian surname, piled up a team-leading 59 points in his first full NHL season this year. Kreider‘s initial arrival in the NHL was greeted with a ton of hype before cooling off significantly. It took some time for him to figure things out at the highest level, but there is ample evidence both in the regular season and playoffs that those who invested in him early will indeed be rewarded if they’ve stuck with him. And if he wasn’t on collectors’ radars before, the window to buy in on the cheap might soon be closing. What do you think? Agree or disagree? Let us know and enjoy the 2014 NHL® Stanley Cup Final!